A relative sent Dave Ring, of Albuquerque, a Maryland newspaper ad in which a local tour outfit offered a springtime Southwestern Adventure Tour of Texas, Arizona, New Mexico, Nevada, Oklahoma, and, oddly enough, Missouri. In Arizona, travelers would visit seven regional wonders, starting with Carlsbad Caverns—which, of course, is over here in New Mexico. The tour company’s website doesn’t currently list this tour, so perhaps someone on staff bought a map. The saguaro cactus does not grow in New Mexico, but that doesn’t stop it from being used in NM imagery—this time, along the Turquoise Trail National Scenic Byway, aka NM 14. Paula Sprigg, of Edgewood, sent in a July article from the Albuquerque Journal announcing the addition of the state’s storied route to Mattel’s Hot Wheels Road Trippin’ series of toy vehicles. 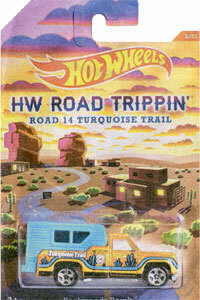 The image (right) on the “Road 14 Turquoise Trail” packaging for the “Backwoods Bomb” camper truck shows two saguaros that’d be much more at home over in Arizona. And more saguaros! Jeff Frye, of Albuquerque, alerted us that Grammy-winning country musician Kacey Musgraves recently released Pageant Material, which includes “Dime Store Cowgirl,” a song she cowrote. “I’ve had my picture made with Willie Nelson,” the singer begins, going on to say she’s “driven through New Mexico, where the saguaro cactus grow.” At least Musgraves is right in those first lyrics: She turns up in an online image kissing a very happy-looking Nelson on the cheek. Send your “Missing” anecdotes to fifty@nmmagazine.com or Fifty, New Mexico Magazine, 495 Old Santa Fe Trail, Santa Fe, NM 87501. Include your name, home-town, and state. Thanks!